Whey protein is a type of protein that is isolated from whey, a watery by-product of the cheese making process. In short, whey protein is derived from cow’s milk. It’s considered a complete protein which means that it contains all 9 essential amino acids. Whey protein is usually also low in lactose which is good for people with lactose intolerance. Whey protein is very much marketed as the go-to food supplement to improve your athletic performance, specifically targeting people that do weight lifting and body building. While there are lots of food sources that are rich in protein (also for vegetarians and vegans), top quality whey protein is indeed very useful for those that need to build lean muscle and to recover from heavy workouts. There are three types of whey protein: concentrate (WPC), isolate (WPI) and hydrolysate (WPH). The concentrate whey form usually provides the lowest protein content and is higher fat and in carbohydrates from lactose. Please note though that this is not necessarily a bad thing. Protein goes happily hand in hand with fat and carbs. Whey isolate is processed such that fat and lactose are removed creating a leaner protein powder. Isolate is usually more expensive than concentrate, but the quality is typically better and it also quicker. Whey isolate is suitable for lactose intolerant people. Whey hydrolysate is the most expensive form. It’s protein that has been processed so that long chains of amino are broken down into single amino acids. It is generally believed that this leads to better absorption by the body. There are also whey protein supplements that provide a mix of all three or two types of whey. They are usually more expensive as it’s more difficult to produce but they provide the benefits of more than just one type of whey protein. What to Look for in All Natural Whey Protein Supplements? There is nothing wrong with added flavors as long as they are natural. In fact, flavoring such as organic cocoa or stevia can even add extra health benefits. Stay away from artificial flavors as they add no value and can even be harmful. Artificial flavors are cheap, and as tempting as cheap protein powder supplements are, it’s better to go for the healthier, natural options. Soy (lecithin) is another ingredient you may come across in whey supplements. Typically used as an emulsifier, it’s not at all considered to be harmful, but personally I would choose for supplements without it. If you do see soy lecithin in the list of ingredients, make sure it’s a non-GMO version. Some people strongly prefer whey protein from grass-fed cows. Why? Because cows are supposed to eat grass, and therefore the end product is considered more natural and simply better. All whey protein powder supplements should tell you how much protein per serving it offers. A good amount is anywhere between 20 and 25g per 30g serving. Don’t just focus on the protein content though, because a high protein content is pointless if the protein powder is of poor quality. When looking for a reliable and all natural whey protein supplement, you’ll notice that there are huge price variations between brands. More expensive doesn’t necessarily equate to better quality though. Look at aspects such as additional ingredients, GMO or non-GMO, organic or non-organic, the protein content, and decide for yourself how much the product is worth. Naked Nutrition is a protein manufacturer that prides itself in producing clean products with only the purest ingredients. They strip out nasty and unnecessary ingredients and they stay clear from costly marketing campaigns. What they do instead is focus on producing simple but top quality products. With Naked Nutrition you will know exactly what you’re buying: pure protein and nothing else. 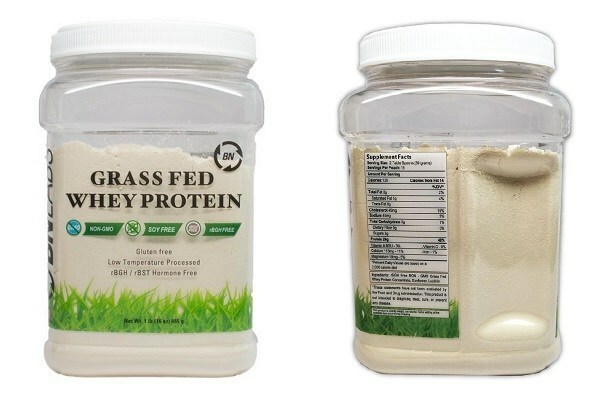 Their popular grass fed whey protein powder comes from dairy cows with a 100% grass-fed diet. The milk is free from any artificial or growth hormones and is non-GMO. This protein product is pure and clean as can be, suitable for those that want to build up lean muscle and support the recovery process after a strength workout. With 25 grams of protein and 5.9 grams of BCAA’s (branched-chain amino acid) per serving of 30 grams, this whey protein is a good choice. 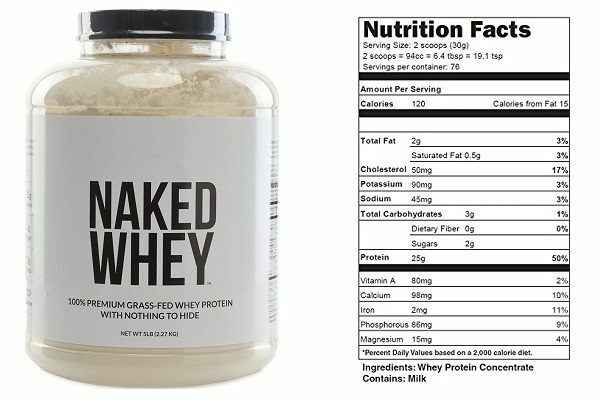 If you prefer flavored whey protein, Naked Nutrition also has chocolate and strawberry flavored grass fed whey protein. They are just as natural, but have extra ingredients such as raw cacao, dried strawberries and coconut sugar. The amount of protein is the same. Alternatively, you can add a bit of fresh orange juice to this type of naked protein supplement to make it easier to drink. Their non-GMO, all natural whey protein product is exactly that: clean whey protein with only two ingredients and no hidden surprises. One serving of 30g provides you with 25g of unflavored and unsweetened whey concentrate. 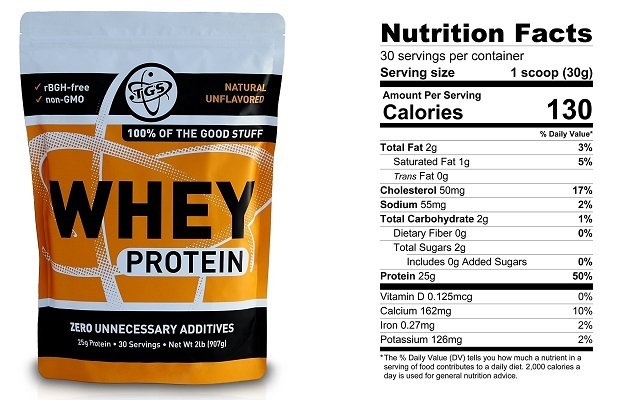 If organic protein powder is out of your budget, TGS all natural whey protein is one of the best alternatives on the market today. Founded in 2012, ProMix Nutrition uses the highest third-party testing standards on their whey protein supplements to ensure their products are the purest and most nutritious they can be. All of their products are non-GMO and free of hormones, additives and other extra ingredients. Their unflavored whey protein supplement is an all-natural whey protein powder with only two ingredients: grass-fed whey concentrate and non-GMO sunflower lecithin. It provides you with 25g of protein (and 5.9g BCAA’s) per 30g serving. They do also sell this protein powder in flavored varieties, such as chocolate, vanilla and even peanut butter, if you do prefer a better taste. Flavors are established by adding ingredients such as non-GMO sugar cane, vanilla extract, peanuts and organic cacao. Opportuniteas is a manufacturer of supplements, tea powders and energy drinks that prides itself in being authentic (using only natural and organic whole foods), transparent (detailed labeling), affordable and customer focused. They also want to be serious about their impact on the world and have partnered with 1% For The Planet, a global network of individuals, businesses and nonprofits that work together for a healthier planet. This means Opportuniteas donates at least 1% of their revenue to non-profit partners that work on issues related to climate change. Very important! Their unflavored, gluten free, non-GMO, grass-fed whey protein concentrate supplement provides 24g of clean protein per 30g serving. At a slightly higher prices, Opportuniteas also offers whey protein powder isolate, if that’s what you prefer. SFH offers a wide range of protein powders to serve different purposes, such as muscle mass building, daily protein intake, endurance performance improvement and muscle recovery. 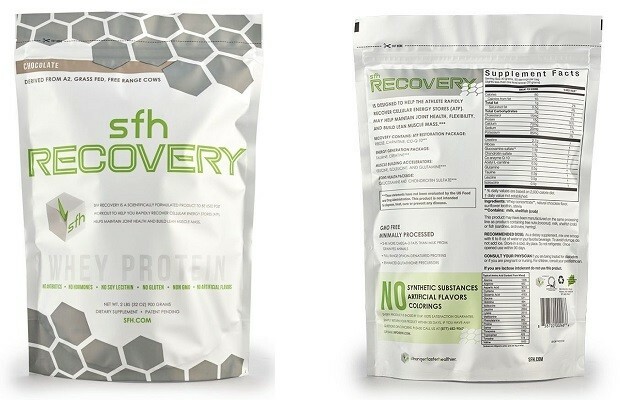 The SFH Recovery whey protein powder is purely a post-workout supplement. It is designed to help you recover your muscles after a solid strength workout. It re-energizes and recovers the tired muscles and help them protect against potential joint injury and the negative effects of free radical oxidants. Their whey protein powder comes from free-range, grass-fed cows that were never treated with growth hormones or antibiotics. 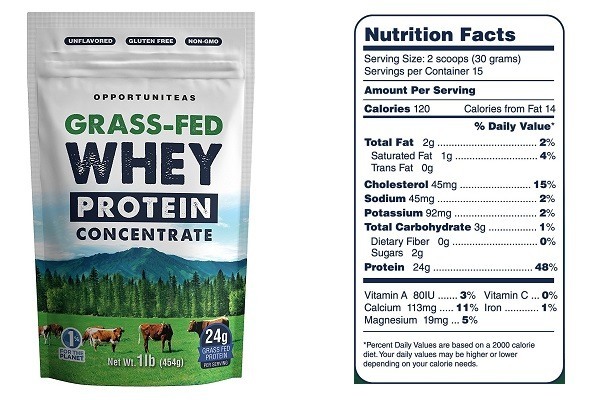 While definitely not the cheapest of products in this list of all natural whey protein powders, their 100% grass-fed recovery whey is 100% non-GMO and is free from gluten and artificial ingredients. If you’re looking for a clean recovery focused protein powder, SFH is a very decent option. Part of British Nutritions, BN Labs was launched in 2013 with a specialized line of products including organic whey protein, vegan protein, high-performance protein and wellness supplements. Their products are formulated with the very best and purest ingredients and tested and certified at the highest quality standards. The BN Labs grass fed whey protein powder supplement is completely natural, non-GMO, hormone free, soy free, gluten free and low temperature processed. 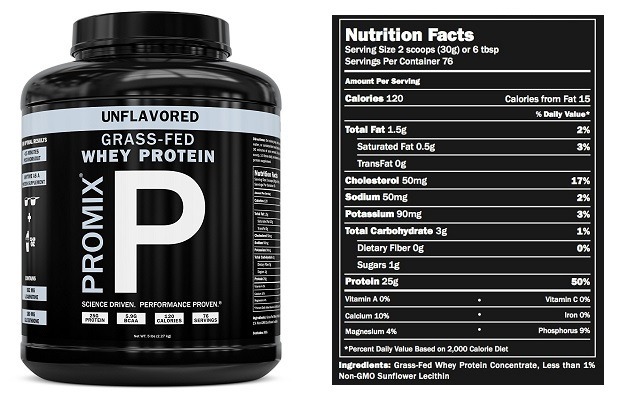 This supplement provides you with 24g of whey protein per 30g serving. It also contains a tiny bit of sunflower lecithin to make this product mix better with water and green smoothies. Protein is something we can easily get from our diets but depending on our lifestyles and habits, whey protein supplements are more than just a luxury item. Unfortunately, lots of protein supplements on the market today are loaded with all types of nasty ingredients that you can’t pronounce. More than often they are also prices very competitively. If you do need whey protein supplements, go for clean, all natural whey protein powders without all the extra ingredients that your body doesn’t like. They may cost a bit more, but they are usually much better value. I created Healthy Food Tribe because I am passionate about health, nutrition and green living, and I want to share my journey towards a better health with you.